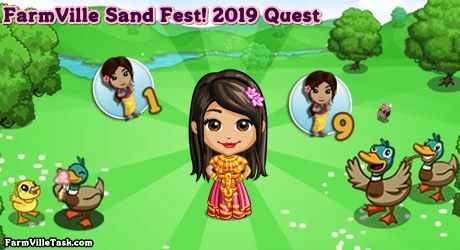 Our friend is inviting us to come along in a very exciting event the FarmVille Sand Fest! 2019. She promises us that this years version will more exciting than the previous one. Let’s help her plan and shop for the materials that she will use for the festival. On this FarmVille Quest, we are going to craft 9 recipes aat the BAKERY, SPA and WINERY. Collect ahead the bushels that we will use for the recipes. Note: Expected to be released on Thursday (April 10). Info: Crafted at the SPA and will need Rice Bushels x15 and Cranberry Bushels x9. Info: Crafted at the and will need Grape Bushels x3, Blueberry Bushels x9 and Raspberry Bushels x9. Info: Crafted at the BAKERY and will need Blackberry Bushels x6, Grape Bushels x2 and White Grape Bushels x6.